Faucets exist to serve a purpose; they deliver the water we use for bathing and cooking. But faucets are so much more than a functional item. If you’ve got basic, boring faucets, you’re missing out on a chance to make a statement. Need some inspiration? 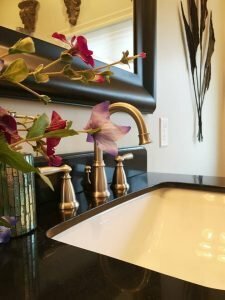 Here are a few of my favorite faucet trends. For kitchen sinks, a faucet with a pull down sprayer is a popular choice. I like to include these in kitchen remodels because they are highly functional, but there are also lots of great, stylish options. This faucet from a recent kitchen remodel is a great example. 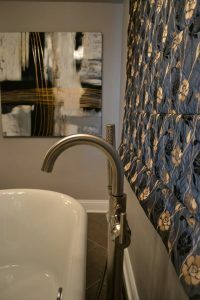 Another stylish faucet trend, especially for the bathroom sink, is a high arch. We have used this style on many of our recent projects, and it looks lovely every time. It also allows more room under the faucet than a traditional low fixture. Geometric fixtures are also popular, and look fashionable when paired with angular lines or prints. 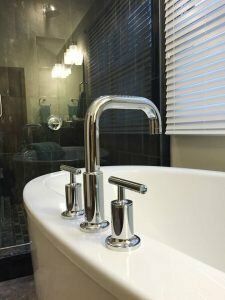 We used this modern faucet in a recent bathroom renovation, and added corresponding towel bars to finish the look. I really enjoy the chrome finish on this fixture as well. Another faucet trend that I love is more about placement than shape. Placing your bathtub fixtures outside the tub is a unique way to make your bathtub stand out. It also allows for a hand-held sprayer, without the nuisance of having it hang down into the tub. These are just a few of the endless options available for your sinks and bathtubs. If you’re interested in updating your bathroom, including the fixtures, come by our showroom. We’re open every weekday from 9 to 5, and Saturdays from 9 to 1. Come talk to us about your home, and we’ll work with you to make it even better.